FILE - In this Jan. 27, 2015 file photo, lllinois Gov. Bruce Rauner speaks about the state of Illinois' economy at Richland Community College in Decatur Ill., during a stop to preview his State of the State address on Feb. 3, 2015 in Springfield. Union supporters plan to rally at the Illinois Capitol to protest Gov. 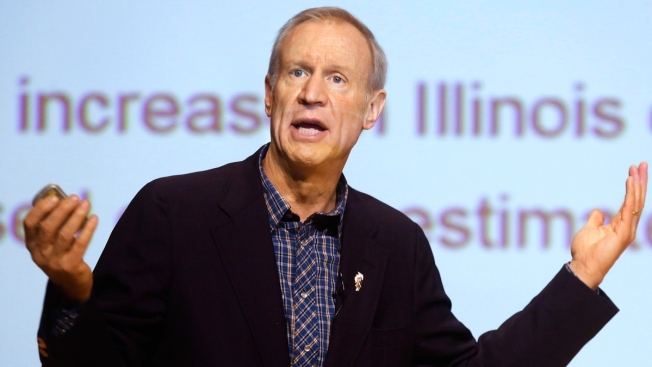 Bruce Rauner's calls to change collective bargaining policies. A coalition of labor groups plans to march by the governor's mansion Wednesday on their way to the state Capitol. Rauner is in the midst of prolonged negotiations for a new labor contract with the largest union representing state workers, the American Federation of State, County and Municipal Employees. The march comes days after he vetoed a measure that would let an arbitrator settle state-employee wages and working conditions if union negotiations stalled. Rauner said appointing an arbitrator would strip him of his power to represent taxpayers at the bargaining table. The governor and AFSCME are making their case to the state labor board as to whether contract negotiations have stalled.